It isn't easy to find an animal who looks more graceful and majestic than the white-tailed deer. When you spot one of these guys skipping throughout the woods, there's a good chance he's out looking for food -- twigs, acorns, nuts or anything else he can eat. White-tailed deer are herbivores, according to the website for the National Geographic Society. These mostly nocturnal grazers aren't too picky about the types of plants they feed on. 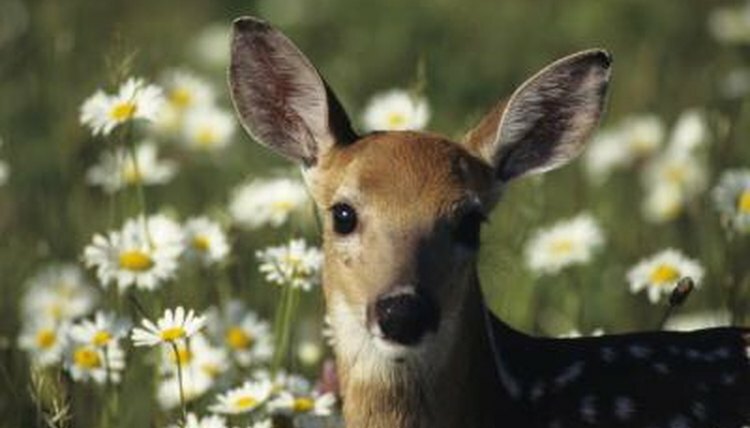 Some staples of the white-tailed deer include grass, nuts, twigs, alfalfa, corn, fruit and fungi. The typical diet of the white-tailed deer does not remain constant all year long. They eat what is easily accessible. In the wintertime food is significantly harder to find, and deer eat a lot of buds, bark and shoots then. During the warmer months they eat nuts, corn and acorns -- and a lot more green matter. What deer love to eat isn't necessarily what they do get to eat all the time. Deer adore fruits and nuts. They love pecans, hickory nuts and beechnuts acorns in addition to acorns. A couple of favorite fruits are apples, blueberries, blackberries and persimmons. Deer occasionally enter yards to get their mouths on flowers, vegetables and ornamental trees -- quite often to the surprise of the homeowners. Other foods that are preferred by these foraging animals include sumac foliage, wild crapapple, dogwood fruit, clover leaves and sedges. Deer eat relatively rapidly, and as a protective measure they never linger in the same spot. These animals will munch on a little bit of something in one area, and then quickly travel over to the next without so much as a second thought. One second you see a deer, the next you don't.